appStrategy is a new series of posts that feature app developers who utilized analytics to make more insightful decisions and get more out of the app store. Our first post is by Michael Sacca the founder of Tiny Factory. Bilingual Child was a side project for us that quickly became our main focus for the better part of the last two years. After the initial success we began experimenting with what else we could do with our early language offerings and found some interesting results. 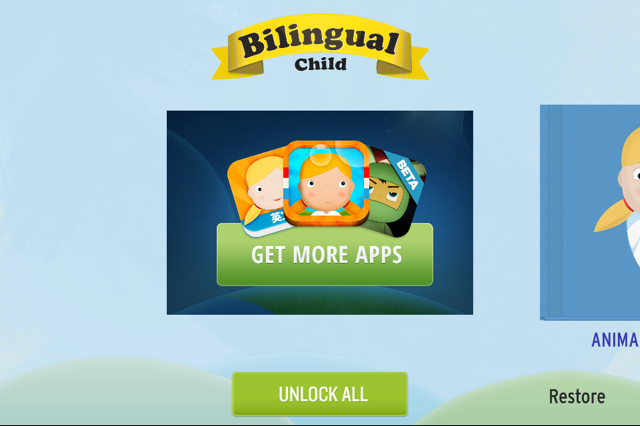 We launched Bilingual Child right around Christmas of 2011 as an early English to Spanish learning application. This was our first iOS application that we’d ever launched and the first application in the ‘edutainment’ space. Upon initial launch we saw a good number of downloads come in from China, Saudi Arabia, Ireland, France & the Philippines. The downloads were decent, but the sales on our in app purchases were lacking (Downloads were free and in app purchases were initially 1.99 per book for additional content). We were making an average of .03 cents per install compared to .16 cents per install in the United States. We were generating interest but because we were translating from English to Spanish our users weren’t interested in purchasing our content. We knew they wanted to learn one language or the other, but the dependency on both was shrinking our target market. In order to scale language education internationally we needed an app that was native language agnostic instead relying on translation. We set out to create a new game that could teach basic English & Spanish vocabulary in any country in the world — regardless of their native language. We used the same branding, icons and sprites we’d developed for the original game but created a new way to interact with them instead of choosing the vocabulary word once, we made a game where the children would consecutively pop bubbles connecting vocabulary words with their icon multiple times per level. This new version didn’t rely on a native language and instead taught through immersion so anywhere in the world we could teach English or Spanish. In a matter of weeks we had a new game in the app store. Upon release we drove our average revenue per install up to .09 cents in those same countries, almost tripling our value showing how much revenue we were leaving on the table by not offering the right product for the market. Once our new applications were launched we created a funnel to drive traffic from Bilingual Child to our new suite of apps. We finally had something to offer our users in addition to our flagship application and they were eager to check it out. Utilize what you have, chances are you’re not taking full advantage of what you’ve already built. On average we have 400 visitors traveling through it per day. These were pre-qualified users who are interested in early language education and already enjoy our applications so we saw immediate traffic coming to our new apps which helped to instantly boost their ranking in the app store. By analyzing our appFigures data we were able to determine that our best sales days were coming in on Monday and Thursday with Saturday and Sunday always steadily higher than our week days. We knew that any marketing we did would be most effective on these days so we focused on what we could do to capitalize on this. We didn’t have a large marketing budget so we had to get creative. When we thought about what drove our sales we took a step back and considered when a parent might download our app. What a better time than a rainy day where kids are stuck inside all day with nothing to do. 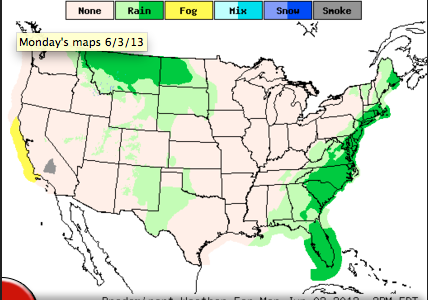 Weather data for Monday June 3rd. Heavy rain on the east coast. Using AdMob’s targeting tools, we ran ads in locations that were experiencing bad weather at the beginning of the day when parents typically take young kids to the park before nap time and again in the late afternoon when elementary schools were getting out. This allowed us to reach parents when they most likely had their children inside and were looking for ways to entertain them. This technique not only led to more sales but allowed us to utilize our limited marketing budget at the exact times when our customers were likely to download and use our application. By taking advantage of the momentum we had already built, reusing assets to quickly create a new experience & some creative growth hacking we were able to add an additional 10k in profit over the last 6 months.